Cardiff City manager Neil Warnock was understandably furious after his relegation-threatened squad lost 2-1 to Chelsea on Saturday when Ruben Loftus-Cheek scored a heartbreaking late goal in the 91st minute. Once the referee signaled that the match was over with a whistle, Warnock left the technical area and went straight to the men whom he believed were a big reason why his team lost: the officials. 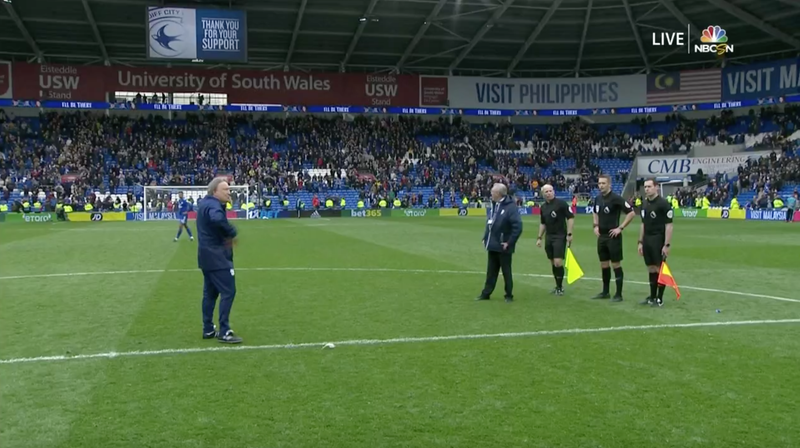 As everyone else was giving handshakes to teammates, coaches and opponents, the Cardiff City boss gave the three officials one of the coldest stare-downs imaginable. Warnock’s march towards the officials was certainly enough to elicit a reaction that made those in the stadium and in the broadcast booth wonder what he was about to do, but, in hindsight, he had become so pissed off at the refereeing mistakes in the game that it would have been more of a shock if he didn’t do anything at all. He had excellent reasons to be so upset. It started with the equalizing goal that César Azpilicueta scored in the 84th minute. A replay showed that the fullback was pretty far offside and yet the line judge’s flag did not go up. Minutes later, another officiating error appeared to rob Cardiff City of a one-man advantage. Chelsea’s Antonio Rüdiger dragged down Víctor Camarasa during a clear goal-scoring opportunity. But instead of getting sent off, Rüdiger was only handed a yellow card. Warnock then took time to actually articulate his frustrations in his postmatch interview with SkySports. In it, he said that these mistakes are why VAR is needed and that, though the Premier League might be the best league in the world, it was the worst officials. To get let down by officials is, you know, roll on VAR. That’s why you need VAR because if you can’t see offside across with a flag, it’s not even close, you know. We worked three weeks for this. When we get let down by decisions, we thought Morrison could have quite easily had a penalty in the first half, we thought he could have quite easily had a penalty in the second half. We thought there was a red card[...] It’s the best league in the world but the worst officials. They don’t understand what is at stake. They shouldn’t make mistakes at this level[...] It’s almost like not who you play, it’s who you get to referee and who’s going to have a flag in their hands nowadays is just as important. As for the stakes that Warnock references, Cardiff City’s relegation battle has just gotten that much more difficult. While they would still have been in the drop zone, three points would have put the club just two points out from Brighton, Southampton and Burnley in the table. Instead, they’re five points behind those clubs with just seven games remaining in the season.